To support its growing commercial music programs, as well as to give a platform for budding artists and music industry professionals, the Liberty University School of Music has acquired Red Tie Music, a professional Christian music publishing and recording label. 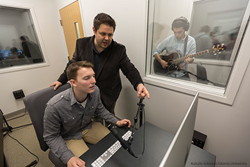 A Liberty University professor instructs students through a recording session in one of the School of Music's new songwriting labs. The availability of music on the Internet and handheld devices has changed the music purchasing and listening habits of the consumer. However, much of the recording industry has yet to adapt to these monumental changes in the marketplace. Whaley views this acquisition as an opportunity, especially considering many college commercial music programs still focus on and teach old models and paradigms for recording, publishing, and producing. “Our curriculum focuses on teaching the students how to get music to the marketplaces,” Whaley said, explaining that the marketplace is virtually unlimited with today’s resources, provided one knows how to leverage various distribution platforms. The addition of Red Tie Music will provide several benefits to students. Those looking to be independent artists will have the opportunity to be mentored by well-known artists and an association with a professional recording label. Students can also record and find a venue for immediately publishing original music. Students will also have opportunities for hands-on training with some of the country’s top studio and live sound engineers. The school will train its commercial music students not simply to record or publish, but to produce (manage the entire process) as well. The vision is to use the already established branding of Red Tie Music as a platform to create a division called Liberty Music Group (LMG). LMG plans to develop a number of print and recording label imprints, including LMG-Gospel, LMG-Praise and Worship, LMG-Classic, LMG-Champion (developmental label for young artists), LMG-Film Score, LMG-Student Worship, LMG-Academic (for printed music education materials), and more. There are also plans for LMG to serve as the official publishing and recording arm of the university and to partner with the Campus Recreation Department to develop a student-run imprint. While serving the entire university student body, the label and its imprints will also market to and provide music to the community at large. Furthermore, LMG will provide opportunities for students, faculty, and industry personnel to publish print music, praise charts, music method books, music anthologies, and music theory handbooks for the classroom and church markets. As construction wraps up this summer on the second of two conjoined buildings comprising Liberty’s new Center for Music and the Worship Arts, plans for a professional recording studio to be added to the first building are being finalized. Construction will begin on the recording studio following the completion of the second building, which includes a state-of-the-art, 1,600-seat fine arts auditorium. The renowned Walters-Storyk Design Group (WSDG) has been secured to design and supervise building the state-of-the-art recording studio. WSDG has built and installed over 3,000 large and small professional sound studios over the last 30 years. The recording studio will have the ability to record live from the auditorium as well as a number of the choir/instrumental teaching rooms, recital halls, practice rooms, and songwriting labs throughout the center. Liberty recently added a new director of audio production, Nathan Zwald, to its faculty. Zwald’s recording and producing credits are numerous, including Matthew West, Rascal Flatts, Mark Schultz, and Steven Curtis Chapman. In addition to extensive live sound experience, his services have been utilized by Sony, Provident, Thomas Nelson, Lifeway, and more. Last fall, the School of Music established a new Department of Commercial Music, which serves as the primary training ground for students interested in becoming professionals in the commercial music industry. Liberty recently added to its Bachelor of Music in Commercial Music a degree concentration in Recording Engineering and Producing, in addition to the existing B.M. in Commercial Music degrees with concentrations in Artist Development, Songwriting, Film Scoring, and Jazz Studies. Liberty also launched a Bachelor of Science in Music & Worship: Publishing and Producing degree under the Center for Music & Worship. Future commercial music degrees are in development, including one in Music Theatre, focusing on training music directors for Broadway and the like. Liberty University, founded in 1971, is the largest private, nonprofit university in the nation, the largest university in Virginia, and the largest Christian university in the world. Located near the Blue Ridge Mountains on more than 7,000 acres in Lynchburg, Va., Liberty offers more than 500 unique programs of study from the certificate to the doctoral level. More than 200 programs are offered online. Liberty’s mission is to train Champions for Christ with the values, knowledge, and skills essential for impacting tomorrow’s world.